Have you heard? Sierra Sandison just earned the crown as Miss Idaho, and she accomplished her goal with an insulin pump clipped to her hip. Yes, that’s right – another Miss America contender has hit the stage with diabetes front-and-center. And since winning Miss Idaho barely a week ago, Sierra has already brought type 1 diabetes to the national stage via stories on NPR, People Magazine, Buzzfeed and a host of other media outlets. Diagnosed with type 1 diabetes just after she turned 18, Sierra is helping empower people with diabetes to wear their devices proudly with the #showmeyourpump hashtag as her rallying cry. Today, Sierra is sharing some some of her diabetes story here on SUM. Kerri: Sierra, you were just crowned Miss Idaho and are off to compete for the Miss America crown this September. Congratulations! And you’re also living with type 1 diabetes! Can you share a little bit about your diagnosis story? Sierra: My dad is a family practice physician, but I was diagnosed shortly after my 18th birthday and had recently moved out of my parents’ house, so we didn’t catch it as quickly as we could have if my dad had been able to see the symptoms. Fortunately, I was never hospitalized! I was extremely thirsty and hungry! It finally got to a point where it was ridiculously inconvenient. One day, I was snowboarding, and had to buy water bottles every time I got done with a run. I would drink them on the way up the chairlift, and then have to “relieve” myself at the top, and then again when I got to the bottom. Then, the cycle would repeat. On the chairlift, I called my dad and said, “Dad, I have a problem. I am an aquaholic. Can I go to rehab for a water addiction?” He immediately knew what the real problem was, since my late uncle and grandpa had diabetes, and my second cousin does as well. However, when it was confirmed, and 550 [mg/dL] popped up on the glucometer, I bawled and bawled and bawled. A diabetes educator came and spoke to my class the next day, because I was terrified that they would make comments along the lines of “it’s your fault”, “maybe if you ate healthier…”, etc. Kerri: I saw on your Facebook profile that you were proudly rocking your t:slim insulin pump onstage at Miss Idaho – were you nervous about showing the judges your diabetes device? What made you decide to go for it and share openly? Sierra: I’m going to be completely honest, it still scares me sometimes to wear my insulin pump. Getting the confidence to wear it on stage has been a journey. When I was first diagnosed, I hated diabetes so much. I just tried to ignore it, and let my blood sugar be high until I felt to sick to deal with it. It was awful. In July, my friend asked me to compete in our local pageant, Miss Magic Valley. I met the director for lunch, who told me everything that was involved. When our food arrived, I pulled out my insulin pen, and she immediately told me about Nicole Johnson, Miss America 1999. 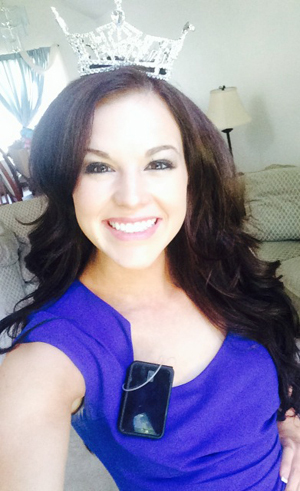 Nicole wore her insulin pump on the Miss America stage while she competed for her title. Knowing that has had such a huge impact on my confidence. As a young woman, we often long to look like the girls in the media: movie stars, super models, cover girls, etc. The media gives us unrealistic expectations, and most of us will never measure up. We soon begin to think that, because we are different from those girls we see, that we are somehow worth less, or less beautiful than them. What a disgusting lie! Unfortunately, I don’t think we can ever completely escape the influence the media has on us. I hope that someday the media can be filled with a variety of beauty! That is one of the reasons I love the Miss America Organization: Nicole Johnson rocking her insulin pump in 1999; Alexis Wineman, the first woman with autism to compete at Miss America, in 2012; Heather Whitestone, the first deaf Miss America in 1995; Nicole Kelley, Miss Iowa 2013, was born with one arm. And countless more women who have inspired the country while competing at Miss America! So, eventually, after thinking about, researching, and following Nicole Johnson, I got the guts to get a pump. However, it took me another year to compete with it. This year at Miss Idaho, I was honestly terrified. I was nervous the judges wouldn’t ask me about it in my interview. I was nervous that the audience would be confused. I was scared the other contestants would think I was using it to try and get pity from the judges. I walked into my interview, and the very first question was about diabetes. It was a huge relief. “I can do this,” I thought, until I walked out of the dressing room, and was immediately asked about the pump. The person who asked me was Miss Idaho’s Outstanding Preteen, McCall Salinas. While my heart sunk when she first pointed it out, that quickly changed when she explained she was a diabetic, but was too scared to get a pump because of what people would think. That was it. I was doing it. I was going to wear the pump for McCall, no matter what people said or thought, and no matter how badly it may affect my score. I walked on stage, and the rest is history. Kerri: Since the competition, you’ve also encouraged others to wear their devices proudly, with the #showmeyourpump hashtag/mantra. What’s the response been like? Sierra: It has been so overwhelmingly AMAZING! You have to understand, I am a completely normal person. My sisters and I are getting embarrassingly excited about all my new followers and likes. It is so crazy how many people were so inspired by me doing such a simple thing! I was prepared for a lot of negative backlash for competing in a beauty pageant with a swimsuit competition involved, but as far as I know, most everyone has been positive! Kerri: Is diabetes advocacy part of your competition platform? Can you tell me about how you plan to use your voice to improve diabetes awareness? Sierra: It was my original platform, but before I was Miss Idaho, I didn’t have much of a voice. My platform now is actually a program my sister and I started for kids with developmental disabilities. We put on sports camps for them! The program is called Possibilities for Disabilities. Originally, we just wanted to give them the chance to participate in the fun extracurricular activities their peers do, because we think that sports and music are important to adolescents in finding their identity, discovering their passions, and building confidence. What we soon realized is that the program was doing so much more! We have students at the high school volunteer as “student coaches” and work with the campers. By placing the kids with disabilities in a fun, empowering, positive environment with their peers, it breaks down barriers and helps the kids form friendships with their peers. This has transformed their lives more than anything else! The entire culture of the high school we work with has changed towards the kids in special ed. They have formed identities beyond their disabilities, and are accepted more than they ever would be at another school. I am so excited to have the opportunity to spread Possibilities across the state, and even across the nation, as Miss Idaho! With my diabetes, the message I try to get across to everyone I come in contact with is this: whatever obstacle they are facing in their life, they can not only overcome it, but use it to become a stronger person, as well as impact the lives of others. There is one girl in my camp who is a high functioning autistic, and has decided to put on a Possibilities camp for her senior project next year. I am so excited. She is doing exactly what I hope I can inspire others to do: take their challenges and use them to serve others. I love Possibilities for Disabilities, but now that I have a more powerful voice as a diabetic, I am ECSTATIC to use it! Who said I couldn’t have two platforms? Kerri: There’s a lot of discussion in the diabetes online community about diabetes stigma. Have you ever been discriminated against in terms of diabetes? How did you handle it? Sierra: Before my family and close friends were educated, there were some hurtful comments about how my diabetes was my fault, because of the confusion between type 1 and type 2. Aside from that, I cannot recall any other negative experiences, aside from confused and slightly cold questions about my insulin pump. I have been very fortunate! Kerri: How can the diabetes community help support you as you make your moves for Miss America? Sierra: In a couple weeks, all the Miss America contestants will be publishing their “People’s Choice” videos. America can vote one contestant into the top 15! Only the top 15 get to compete in the televised portion of the pageant. It would mean the world to me if the diabetic community would help me win People’s Choice to guarantee that I have the opportunity to compete with my pump on national television! Kerri: Sounds like a plan, Sierra. Is there anything else you’d like to share? I have also had a lot of people ask me about sending letters and gifts! I adore snail mail, so everyone is welcome to send mail to: Sierra Sandison, P.O. Box 6159, Twin Falls, ID 83303. I love you all so, so much! Thank you again for all your support! Thanks, Sierra! You can follow more from Sierra on her personal blog, Miss Idaho, and via the #showmeyourpump hashtag. We’ll be following your journey to Miss America this fall, and supporting you along the way! Designing for Diabetes: An Interview with Natalie Balmain Diabetes Connections, with Stacey Simms. Go Bionic: Ed Damiano, Clara Barton Camp, and How the Bionic Pancreas “Really Works.” Hacking Diabetes. Diabetes Art Day: PWD Paper Dolls. Not enough likes for this, or for this trend. Thanks for bringing us this interview. Something NEW to love about this woman: she worried what people would think about her being in a pageant! That is so lovable. So aware. So confident. Love. The first time someone noticed me doing somehting d related with my daughter, we were at the beach and I was doing a site change on the boardwalk. DD was in her little bikini, age 6, and a teenager in a two piece came up to show us her omnipod, tucked on her tummy under her suit. On the way home we saw a big guy with a cgm on his tummy crossing the street from the beach. Who says bathing suit season and D gear don’t go together?! I’ve love to see a collage of ppl in swimsuits with their D tech attached however they could get it to work. So great. Congrats to Sierra, not only for her winning Miss Idaho but also for being confident. Sometimes we find ourselves just wanting to hide the condition, she has shown that it is incredibly freeing to bring it out into the open without worry. High five.